In commemoration of the 9/11 attacks at the World Trade Center in New York City that killed over 400 firefighters, paramedics, and police officers, the local volunteer department was honored with two donations last week. 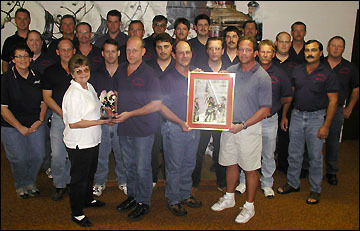 Ruth Jones (left), manager of Casey's General Store, hands a firefighting figurine to Denny Nacey, assistant fire chief, while Dan Severance (right), postmaster, hands a framed copy of a new stamp, depicting firefighters raising a flag at Ground Zero in New York City after the 9/11 attack, to Jim Freilinger, fire chief. Nacey and Freilinger accepted the gifts on behalf of the entire department: (front row, from left) Cathy Christenson, Lenny Gilmore, Jack Winter, Mike Stern, Gerry Mehr, Chuck Hagen, and Mark Guenther; (middle row) Joel Burr, Ron Mergen, Gary Gruber, Kelly Mohr, Jeff Ruprecht, David Lange, and Mike Jensen; (back) Jamie Soine, Bob Wander, Brent Ford, Roger Torborg, Ken Reiman, Tom Fordyce, and Bob Liestman. Not pictured are Tony Eull and Shawn Evans. First, postmaster Dan Severance presented the department with a framed copy of a new stamp depicting firefighters raising an American flag at Ground Zero in New York City. The Heroes of 2001 semipostal stamp is the second in U.S. history to have its net proceeds above postage earmarked for a specific purpose, in this case to provide assistance to the families of emergency service personnel who were killed or permanently disabled in the line of duty on Sept. 11, 2001. "The (U.S.) Postal Service has a proud tradition of issuing stamps to help raise awareness of social issues," explained Severance. "This stamp continues our active role in helping members of affected communities. We encourage everyone to purchase and use the stamp on your cards and letters." The 45-cent stamp is valid for postage at the current first-class mail, first-ounce letter rate (currently 37 cents) with the difference (less reasonable costs) going to the Federal Emergency Management Agency to provide assistance to the families of emergency relief personnel killed or permanently disabled in the line of duty on Sept. 11, 2001. The eight-cent differential consists of a tax-deductible charitable contribution. The Heroes of 2001 is the second stamp to raise money for a cause. The first was one for breast cancer research, which has raised $25 million since being issued. The local fire department was also honored by Casey's General Store with a figurine of a firefighter and with free pizzas for the department during their monthly business meeting on Monday, Sept. 9. Fire chief Jim Freilinger said it was nice to be appreciated a year after the 9/11 attacks. "It really makes us feel great," he said, "that people feel that way towards their volunteer department."